Dedicated in 1990, the Shrine was built as an act of faith and love for the parishioners of the Sangre de Cristo Parish. It is a place of prayer and solace open to members of all faiths and people of good will. 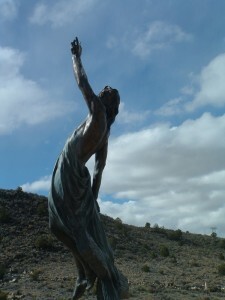 The Shrine is located on a mesa (flat top mountain) in the center of San Luis, which is Colorado's oldest town. The Shrine is formally known as "La Mesa de la Piedad y de la Misericorida" or The Hill of Piety and Mercy. Here we have recreated our Calvary. The Stations of the Cross are a series of graphic meditations on the last hours of Christ's life. They are beautifully depicted in a series of 14 bronze sculptures of Christ's passion and resurrection. (See our Photo Gallery page for pictures of the sculptures.) They rest along a half mile, climbing trail that offers opportunities for meditation and reflection. At the top is the Chapel of All Saints, "La Capilla de Todos Los Santos." The trail culminates at a grotto of Our Lady of Guadalupe, The Mother of God. This grotto holds pink sandstone statues of the Virgin Mary and Juan Diego. The grotto reminds us of the special place in the role of our salvation and the love that Hispanics have for Mary, Our Lady of Guadalupe.